A French police officer stands guard outside Saint-Charles train station in Marseille, where a suspected Islamist knifeman killed two women on Sunday, October 1. French authorities on Tuesday detained four people suspected of helping a man who later stabbed to death two women in the southern port city of Marseille. In a separate case, five people remained in custody after being detained by French authorities over an apparent failed bombing attempt in an apartment building in a chic Paris neighborhood. The two developments occurred on the same day that the lower house of the French Parliament approved by an overwhelming majority a controversial security law intended to strengthen police and intelligence capacity in fighting the extremist threat. France has seen numerous attacks in recent years, including 130 killed in Paris in November 2015. The National Assembly passed the bill Tuesday by 415-127. It still has to go to the upper house and then return to the assembly for a final vote. The law would make permanent some of the measures imposed as part of a state of emergency that began just after the Paris attacks. Critics say the bill infringes on individual liberties and puts the country in a permanent state of emergency. 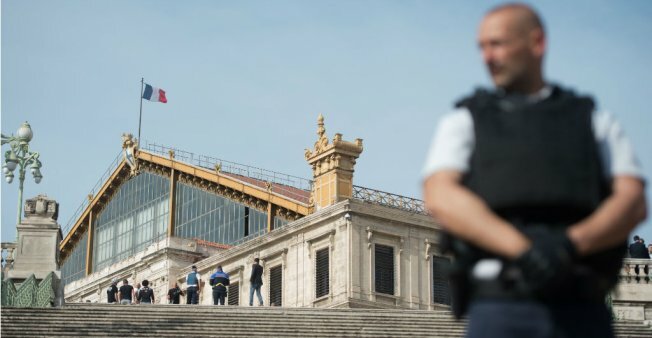 In the Marseille probe, a judicial official said four people were detained Tuesday in the probe into Sunday's killing of two young women at the city's main train station. The attacker was killed by soldiers just after the stabbings, which were claimed by the Islamic State group. The four are being held in custody on suspicion of criminal association in relation with a terrorist undertaking. Several locations were searched in the investigation. The official, who spoke on condition of anonymity under internal rules, wouldn't give more details. Interior Minister Gerard Collomb said on France Inter radio that the assailant in Marseille had Italian residency and a valid Tunisian passport. One of the seven IDs the attacker used in previous encounters with French police was a Tunisian passport identifying him as Ahmed H. A judicial official said that authorities have determined that is the Marseille attacker's true identity. Collomb said he has ordered an internal investigation into why the attacker had seven encounters with French police and had no residency papers, but wasn't expelled from the country. His latest arrest was just two days before the stabbing, when he was picked up for shoplifting and released. Rome prosecutors opened their own terrorism investigation into the suspect, identified in the Italian media as Ahmed Hanachi. He had lived in Aprilia, south of Rome, from about 2006 to 2014, Italian news agency ANSA said. The area south of Rome was also where the Berlin Christmas market attacker, Anis Amri, spent about a week in July 2015 after getting out of an Italian prison. There's no indication the two ever crossed paths, the daily La Repubblica said, without citing sources. Meanwhile in Paris, police said Tuesday that a neighbor alerted authorities to suspicious activity early Saturday in the building in the posh 16th arrondissement, or district. A judicial official said an explosive device was found and deactivated and that counterterrorism prosecutors have opened an investigation. He was not authorized to be publicly named discussing an ongoing case. One of the suspects was under government surveillance for radicalism. Asked to explain how someone under surveillance could carry out an attempted attack undetected, Collomb said radicals usually have "friends, networks that can carry out the act," people who don't show outward signs of radicalization "but are ready to help." He said the incident shows that the threat against France remains "extremely big." "Blowing up a building in a chic neighborhood of Paris - is this not a sign that no one is safe? This doesn't happen just in suburbs in working class neighborhoods," he said. Collomb also stressed the importance of the new counterterrorism law. "We are still in a state of war, even if the Islamic State group has seen military defeats," he said.